The MSA Latchways Personal Rescue Device is an unobtrusive personal rescue device that is an integrated full body harness system for self-rescue. In the event of a fall, the worker can gently lower themselves to the ground in a controlled descent. 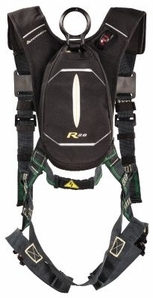 The Arc Flash version of MSA Personal Rescue device features the EVOTECH Arc Flash Harness with Quick Connect Leg Straps. The PRD is available in two sizes, Standard and X-Large. The Latchways Arc Flash PRD provides an extra level of safety from electric arc-flash or arc-blast exposure after a fall, no matter what structure or building you have to access.